Synopsis: A seventeen-year-old aristocrat falls in love with a kind, but poor artist aboard the luxurious, ill-fated R.M.S. Titanic. Did You Know? The film has the distinction of being 1 of 2 pictures to receive a record 14 Oscar nominations, and subsequently being 1 of 3 pictures to win a record 11 Oscars. Quotables: TOMMY: Music to drown by. Now I know I’m in first class. You can say what you will about James Cameron’s Titanic, but will always love it. It was the first non-animated film that I fell head-over-heels in love with. My 9-year-old self was dazzled by its stunning and epic beauty. 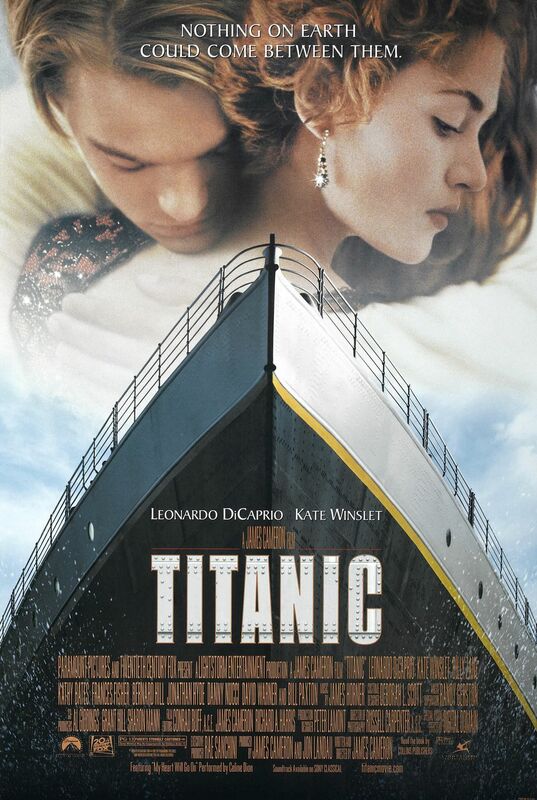 In fact, I became so infatuated with it that I managed to persuade my parents to take me to see it a total of three times, I checked out every book about the Titanic from our library, and I saw it when it was re-released in 3D a few years ago. I’ve seen it so many times that I can quote the whole thing, with perfectly synchronicity. Because of my deep obsession, this was the year that I first became aware of the Academy Awards. I watched it from start-to-finish, and I was so excited that Titanic kept winning everything. Though I remember being particularly perturbed when Sharon Osbourne made some snarky, irritated remark when Titanic won whichever award she was presenting. I admit that James Cameron is not the greatest writer. He knows how to tell an epic story, but they would be that much greater if he had a better writer at the helm. If you played a drinking game for every time Leo and Kate said “Jack” or “Rose”, you’d die of alcohol poisoning before the ship sank. Nevertheless, this will always be one of my favourite movies.